(NaturalNews) Processed foods and the loads of nutrient-stripped salt that they typically contain could be a leading cause of autoimmune disease, according to new research. 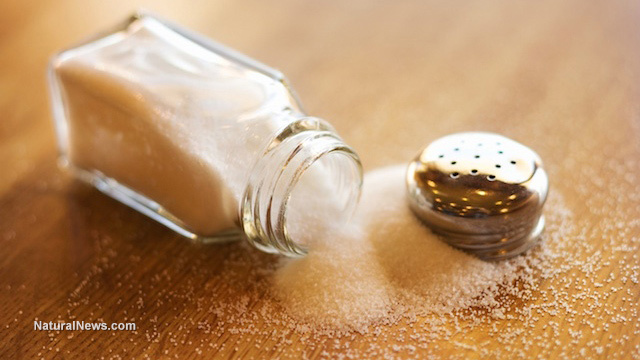 Scientists from Yale University and the University of Erlangen-Nuremberg in Germany found that excess consumption of refined and processed salt increases one's risk of developing conditions like asthma, eczema, alopecia and multiple sclerosis (MS). An international team of researchers sampled 2,124 fast food items from places like Domino's Pizza, Kentucky Fried Chicken (KFC), McDonald's, Pizza Hut, Burger King and Subway, testing them for salt content. They found that most of the products sold at these establishments contain excessively high amounts of processed salt -- and in the U.S., at levels up to twice that of other countries. Even when some of the products tested were branded as being "low-fat" or "low-calorie," researchers found that they contained unseemly amounts of salt to compensate for their lack of flavor. The result of this, they say, is that certain cells in the body become hyperactive in the presence of this salt, potentially triggering an inflammatory process that can lead to autoimmune disease. "This study is the first to indicate that excess refined and processed salt may be one of the environmental factors driving the increased incidence of autoimmune diseases," stated the authors. In order to fend off harmful pathogens, the body relies upon T cells, which help activate the immune cells responsible for targeting bacteria or viruses. Included in the T cells category is a subset of cells known as Th17, which adaptively develop, as needed, to address incoming threats. When exposed to refined table salt, however, these Th17 cells tend to malfunction, becoming more aggressive than usual. It is in this aggressive state, Th17 cells promote inflammation rather than mitigate it, a phenomenon that a growing number of scientists believes is a trigger for autoimmune disorders. In the lab, tests revealed that exposure to refined salt causes Th17 cells to release up to 10 times more cytokines than normal. This so-called cytokine "storm" can damage the immune system by overextending it, which in some cases results in the body attacking itself rather than appropriate foreign invaders. Salt is an important part of life, of course, but the type of salt consumed makes all the difference. Unlike refined table salt, sea and earth salts that contain dozens of unique trace minerals are highly beneficial and have not been shown to cause the type of immune damage that can result from consuming too much processed salt. A unique transformation occurs when the trace minerals in sea and earth salts are exposed to water, which separates them into mineral ions that the body uses to perform a multitude of important functions. These minerals carry an electrical charge, hence their designation as electrolytes, that protects against disease. They are also critical in the normal function of cells and organs. These trace minerals and their resultant electrolytes simply don't exist in processed sodium chloride, the most common type of salt used in processed foods. Both processed salt and the processed foods to which it is added contain minimal nutrition, hence the dysfunction that results from consuming them. "In water, salt dissolves into mineral ions," said Dr. Barbara Hendel, researcher and coauthor of the book Water & Salt: The Essence of Life. "These conduct electrical nerve impulses that drive muscle movement and thought processes. Just the simple act of drinking a glass of water requires millions of instructions that come from mineral ions. They're also needed to balance PH levels in the body."